STOP PRESS: On March 18th Cicerone published a new edition of the Mountains of Greece guide under the title Trekking in Greece: The Peloponnese and Píndos Way. It consists mainly of a description of this route, The Peloponnese and Pindos Way. If you are contemplating doing part or all of the route, you will need to do three things. 1) Acquire this guidebook. 2) Check for updates either here (see the Contents list to the right of this page) or on the Cicerone website. 3) Arm yourself with a GPS and the relevant Anavasi maps. The mountains of Greece are among the loveliest and least developed in Europe, a real walker’s paradise. They cover most of the country. With my friend Michael Cullen, who grew up in Greece and founded its very first trekking company, we are in the process of creating a long-distance hiking route that bisects the country from north-west to south-east, the whole thing to be called The Peloponnese and Pindos Way. As you can see from the map below, the route is cut in two by the sea in the Gulf of Corinth, with the Peloponnese to the south and the Pindos to the north. The ferry that used to join the two ends no longer runs. So, on the presumption that Athens is the most convenient arrival point for most people, we have described The Peloponnese Way north to south and The Píndos Way south to north. We think there is a kind of logic to this solution! 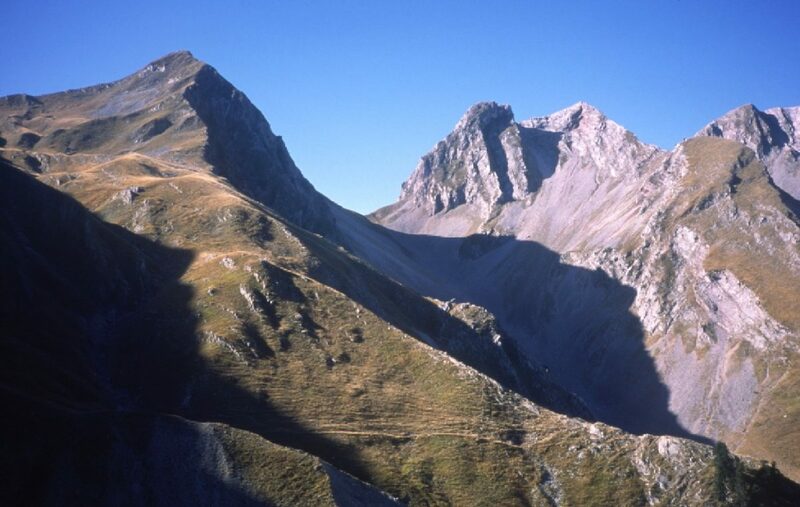 The Pindos Way, the subject of this website, is the northern bit, traversing the central mountain backbone of the Pindos range, from Albania to the Gulf of Corinth. The southern part of the route, The Peloponnese Way begins in the middle of the north shore of the Gulf of Corinth and cuts across the Peloponnese almost to Cape Tenaro, the most southerly point of the country and the second most southerly point in continental Europe. The northern part is more Balkan in landscape and climate, the southern more Mediterranean, which also means that the hiking season between snowmelt and first snowfall is a month or so longer. The landscapes will be a surprise to people who know only the seaside and islands of Greece: forests of beech, fir and pine, alpine meadows, numerous peaks above 2000m, rivers and waterfalls, remote and handsome stone-built villages, flocks of transhumant sheep, rich and varied populations of wildflowers and some big beasts, in the form of wolves and brown bears – though you will be lucky to catch a glimpse of these. If you need further convincing, take a look at the website of Jane and Alan Laurie, in which they describe their epic walk from the Prespa lakes in the far north-western corner of Greece to the south of the Peloponnese. Their route, though they did the Píndos part in reverse, north to south, is pretty much the same as ours. It is a wonderfully fresh and evocative account of the landscapes they passed through and their adventures and encounters. See also Jane’s article for Cicerone Press. You might also find my book The Unwritten Places interesting (available on Amazon); it tells the story of my first explorations of the Píndos in the 1970s. There is also a TV documentary called Dhiáva – The Autumn Journey that I made with David Hope about the Vlach shepherds of the northern Píndos and the autumn transhumant journey when they drive their flocks down to the lowlands for the winter (available on YouTube; the one uploaded by cyclingdave45 is the genuine whole thing), with an additional 30mins video footage under the title Summer in Samarína.There is also a Greek language version that was shown on Greek TV in 2001. This project started life in the seventies when I was teaching in Athens and looking for somewhere to go in my leisure time. Sun and sea tourism had already begun to overrun the seaside and island places that I had first known as a student in the sixties. I was looking for somewhere the “old” Greece still lived on. A look at the map showed that the brownest, most roadless and least populated part of the country was the Pindos mountains. And then I came across an article in the journal of the Royal Geographical Society for September 1964 (vol 130, part 3) written by Lord Hunt of Everest fame, in which he described an expedition he had undertaken to the Pindos in 1963 with a party of young Greeks and English. Just what I was looking for! And I set off to follow my own route up the Pindos. Over the years it turned into a walkers’ guide to the mountains in Greece published by Cicerone Press. And for the last ten years it has been a joint effort with Michael Cullen. For the latest edition, due out early in 2018, we decided to cut pretty much everything else and concentrate on creating this one long route traversing the whole country. Calling it The Peloponnese and Pindos Way does, we realise, suggest there is a recognised, established route, like the Pennine Way or the GR20 or the Chemin de St-Jacques. Well… there is and there isn’t! The Peloponnese Way is pretty well established, much of it following the route of the E4 path, which has been resuscitated from years of neglect by Rolf Roost. The Pindos Way, while entirely followable, is a bit more problematic; the waymarking and maintenance is inconsistent or non-existent and the terrain both higher and more remote. All these routes are based on what remains of the incredibly dense network of footpaths connecting villages and hamlets and high summer sheepfolds that were the only roads in these mountains until the Second World War. Unmapped and known only to the locals, they made these mountains more or less impenetrable to strangers. They became the natural resort and hideout of all manner of brigand, outlaw, and rebel, both against the Turkish overlords who ruled the land for centuries after their conquest of Constantinople in 1453 and, in more modern times, against German and Italian invaders in the Second World War and, in the case of Communist insurgents, against their own government in the 1940s. What we call the Pindos Way was known as the πορεια των ανταρτων, the Rebels’ Route. Our great hope is that by naming the route and making it the title of the new edition of the Cicerone Press guide we can will it into existence, attracting attention to it and encouraging Greek walkers and Greek locals who live along its route to take it seriously and work towards establishing it as one of the great walks of Europe. In 1988 John Cleare, the great mountain photographer and climber, published a book called Trekking: Great Walks of the World, to which he asked me to contribute a chapter about the Pindos mountains, called The Rocky Spine of Greece: the Pindos Traverse, which described pretty much exactly the Pindos half of this route. The Peloponnese and Pindos Way does indeed deserve to be ranked among the great walks of Europe. So, walkers of the world, let us get out there and make sure it is so ranked. Walk it, mark it, sing its praises, spend some money in the villages. My friend Kate Clow’s Lycian Way in south-west Turkey has earned its substantial reputation in fifteen years. At first, the local peasantry scratched out the waymarks, riddled the signs with bullet holes…but that did not stop the crazy foreigners. They kept coming, bringing their much-needed money and, as we know, money talks. Now the locals open guesthouses, stock the village shops with walkers’ necessities… In Greece it will be the same. Guesthouses will open. Villagers will take on the responsibility of keeping their sections of path open. Think of the Chemin de Saint Jacques in France and Spain with its 17-20,000 walkers every year, each leaving 50 euros a night in villages with little other source of income. One hundred, let alone 500, walkers a season would make a significant difference to the economy of remote Greek mountain villages and facilities would quickly improve. The contents are listed under Pages in the top right corner of every bullet-pointed section. For the moment they consist principally of notes on each of the four main sections of the Pindos Way route. Ο ορειβατικὁς οδηγὁς, The Mountains of Greece, που πρωτοβγἡκε το 1986, θα κυκλοφορἡσει στις 15 Μαρτιου 2018 με το τἱτλο Trekking in Greece: The Peloponnese and Pindos Way (Tim Salmon and Michael Cullen, Cicerone, Oxenholme Rd, Kendal LA9 7RL, UK). Πρωτοπἡγα στην Ελλἁδα το Πἁσχα του 1958 μαθητἡς λυκεἱου. Γοητἑυτηκα και ορκἰστηκα να γυρἱζω ὁσο πιὁ σὐντομα μποροὐσα. Και ἑτσι ἐκανα. Κἁθε καλοκαἱρι που ἡμουνα φοιτητἡς πανεπιστημἱου κατἑβαινα με ωτοστὁπ. Γὑρισα και πἁλι μετἁ το πανεπιστἡμιο και βρἡκα θἑση σα καθηγητἡς στην Κρἡτη. Τη διἀρκεια της Χοὐντας ἡμουν στο Λονδἱνο στη γειτονιἁ του Camden Town, ὁπου εἱχαν εγκαταστηθεἱ οι περισσὁτεροι Κὑπριοι πρὁσφυγες και βρἡκα στη δημὁσια βιβλιοθἡκη ἑνα βιβλἱο, Τα Ελληνικἁ Βουνἁ, που διηγιὁταν τις ορειβατικἑς εκδρομἑς κἀποιου ορειβἁτη. Λἱγο μετἁ διἁβασα σ᾽ἑνα τεὑχος του περιοδικοὑ Journal of the Royal Geographical Society ἑνα ἁρθρο του Lord Hunt, αρχηγοὑ της πρὡτης Βρεττανικἡς αποστολἡς που κατἑκτησε την κορυφἠ του Ἑβερεστ, ὁπου περιἑγραφε μἱα εκδρομἡ που εἱχε κἁνει τον Απρἱλιο του 1963, με μἱα ομἁδα νεαροὑς, οι μισοἱ Ἑλληνες, οι μισοἱ Ἁγγλοι, που ξεκἱνησε απὁ την Ἁμφισσα και διἁσχισε ὁλη την Πἱνδο μἑχρι την Καστοριἁ. Με ενἑμπνευσε και πἠρα την απὀφαση να ξεκινἡσω και εγὡ με την πρὠτη ευκαιρἱα. Και αυτὀ ἑγινε το ῾76-77. Χἁρτες μεγἁλου κλἱμακος δεν κυκλοφοροὑσαν τὁτε. Ἑπρεπε να ρωτἁω απὁ χωριὁ σε χωριὀ. Στην επαρχἱα ο ἁσφαλτος ἑλειπε τελεἱως σε πολλἑς περιοχἑς. Παρ᾽ὁλο που ο κὁσμος εἱχε ἡδη λιγοστἑψει στα χωριἁ και αυτοἱ που ἑμειναν δεν κυκλοφοροὑσαν πιἁ με τα πὁδια, θυμὁντουσαν με ακρἱβεια που πἑρναγαν τα μονοπἁτια και μου το εξηγοὑσαν με μεγἁλη υπομονἡ. Υπἡρχαν ακὁμα τα τελευταἱια στοιχεἱα της παραδοσιακἡς ζωἡς – λἱγες καλλιἑργιες με αυλἁκια που κατἑβαζαν νερὁ για πὁτισμα απὁ ψηλἁ, νερὁμυλοι, ταχυδρὁμοι που τριγὑριζαν στα χωριἁ με ζὡα, καρβουνἁριδες και ξυλοκὁποι που δοὑλευαν στο δἁσος, χορτἁρια για τα ζὡα θερισμἑνα με δρεπἁνι…. Ζωἡ δὑσκολη για τους ντὁπιους. Για μἑνα σκἑτη μαγεἱα. Ὁσο προχωροὑσα μἑσα στα βουνἁ και ανακἁλυπτα τις ομορφιἑς τους – τα ατελεἱωτα δἁση με ἑλατα και οξιἑς, ποτἁμια και φαρἁγγια, μἑρη απἁτητα απὁ κἁθε μορφἡς ὁχημα, ξὑλινα γεφὑρια, πετρὁκτιστα χωριἁ, μεσαιωνικἁ μοναστἡρια κρεμασμἑνα σε απἱστευτους γρεμνοὑς, καλντερἱμια, λιβἁδια γεμἁτα αγριολοὑλουδα την Ἁνοιξη – διαμορφὡθηκε μἑσα μου η ιδἑα να γρἁψω κἁτι και εγὡ για τα ελληνικἁ βουνἁ, ἑναν ορειβατικὁ οδηγὁ που θα τραβοὑσε ορδἑς ορειβατὡν! Σε πἁνω απὁ τριἁντα χρὁνια ο Michael και εγὡ ἑχομε περπατἡσει σε βουνἁ πολλὡν ἁλλων χωρὡν, μἑχρι στο Νεπἁλ και στο Τατζικιστἁν. Πιστἑυομε ὁτι η διαδρομἡ αυτἡ αξἱζει να καταταχθεἱ ανἁμεσα τις ομορφὁτερες πεζοδρομικἑς διαδρομἑς της Ευρὡπης. Πἑρα απ᾽αυτὁ οι περιοχἑς που περνἁει η διαδρομἡ εἱναι βαθιἁ δεμἑνες με τις πιὁ σημαντικες παραδὁσεις και αξἱες και γεγονὁτα που ἑδιναν στην Ελλἁδα το χαρακτἡρα της. Αποτελοὑν ἑνα σημαντικὁ μἑρος της κληρονομιἁς της πατρἱδος. Για να γἱνει ὁμως γνωστἡ στους κὑκλους των διεθνὡν ορειβατὡν πρἑπει να βγοὑμε να τη πατἡσομε! Σκἑφτομαι το Lycian Way η Likya Yolu στην ΝΔ Τουρκἱα, που την δημιοὑργησε μἱα φἱλη μου αγγλἱδα, η Kate Clow, το 2001. Στην αρχἡ οι ντὁπιοι, καχὑποπτοι, πυροβὁλησαν και ἑριξαν κἁτω τις ταμπἑλες. Τὡρα, που κατἁλαβαν ὁτι το περπἁτημα αρἑσει σε ξἑνους με λεφτἁ, προσἑχουν τα μονοπἁτια και δεν προλαβαἱνουν να ανοἱγουν ξενὡνες. Για να πἁρει τη σωστἡ θἑση της στην πανοπλἱα των Ευρωπαἱïκων ορειβατὡν The Peloponnese and Pindos Way χρειἁζεται βἁση ελληνικἡ, κυκλοφορἱα αρκετἡ για να πεἱσει τους ντὁπιους και τους τοπικοὑς ορειβατικοὑς συλλὁγους ὁτι αξἱζει ο κὁπος να συντηρἡσουν τα μονοπἁτια τους. Ορειβἁτες και φυσιολἁτρες της Ελλἁδας ενωθεἱτε και ξεκινἡσετε!